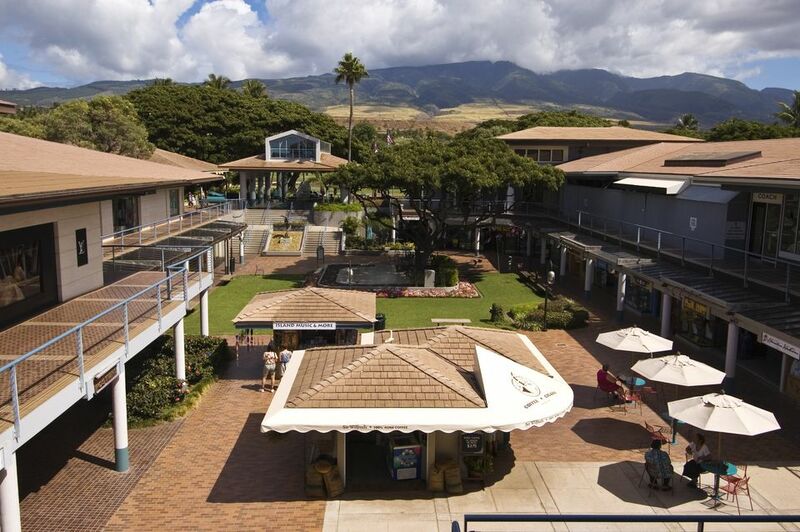 Whalers Village Fine Shops & Restaurants is West Maui's premier shopping destination. It is centrally located on 8.5 acres within the Ka'anapali Beach Resort which is home to five major award-winning resort hotels, six condominium resorts, an oceanfront beach walk that connects all of the condominiums, hotels and shopping village, two championship golf courses, tennis courts for day or night play and, of course, the world-famous Ka'anapali Beach, one of the top beaches in America as selected by Dr. Stephen P.
Whalers Village offers not only great shopping, but also a wide range of dining options, a museum that honors Maui's seafaring roots, and an extensive events calendar throughout the year. The Village underwent a major renovation and expansion in 1996, but upgrades and modernization are constantly taking place. Whalers Village is located in West Maui oceanfront on Ka'anapali Beach and the Beach Walk promenade with views of the islands of Lana'i and Moloka'i. The Village is located four miles north of Lahaina, 27 miles and a 50-minute drive from the Kahului Airport and 4 miles and a 10-minute drive south of the Kapalua Airport. Whalers Village is open daily from 9:30 a.m. to 10:00 p.m.
A 534-space covered parking lot is available, where visitors receive up to three hours validated parking with a minimum purchase. A complimentary shuttle that operates throughout the Ka'anapali Beach Resort makes regular stops at the Village. Whalers Village offers a wide assortment of shopping ranging from a top Hawaii sundry store (ABC Store) to high-end boutiques. Within the Village are over 20 apparel stores including such island favorites as Blue Ginger (island fashions and casual resort wear), Crazy Shirts (high quality t-shirts), Honolua Surf Co. (internationally-known surf apparel), Kahala (island sportswear), Tori Richard (island sportswear) and Tommy Bahama (fashions and island-inspired home furnishings). For shoppers seeking the ultimate in high-end boutiques, Whalers Village in offers Coach (high-fashion accessories—leather goods, silk scarves, business essentials, handbags, and stylish gifts) and Louis Vuitton (leather goods for men and women). For those seeking gift, art and specialty stores, Whalers Village offers a wide variety including such unique Hawaii stores as Honolulu Cookie Company (locally-owned gourmet cookie company), Lahaina Printsellers (original and reproduction antique maps and rare prints), Lahaina Scrimshaw (traditional engravings onto whale ivory using fossil ivory) and Martin & Macarthur (fine woodwork gifts and furniture). Top island jewelry companies include Baron & Leeds, Dolphin Galleries Jewelry, Jessica's Gems, Maui Divers of Hawaii, Na Hoku and the Pearl Factory. In addition over a dozen kiosks are located throughout the Village representing limited merchants, vacation rental resort and activity providers. You can visit the Whalers Village website for a full index of all merchants. Whalers Village has numerous dining options and one to suit all budgets. There are two oceanfront restaurants - Hula Grill at Ka'anapali Beach and Leilani's on the Beach. Chef Peter Merriman's fine dining restaurant, Hula Grill, serves his well respected Hawaii Regional Cuisine in a plantation-era beach house setting featuring a kiawe wood-burning oven. His dishes feature the finest in fresh seafood and locally grown produce. The adjacent sand-floor Barefoot Bar is the perfect place for a more casual lunch or dinner while enjoying some great local music performed live daily. I have had the pleasure of many lunches at the Barefoot Bar and one of the best dinners of my Hawaii travels at the Hula Grill. Leilani’s On the Beach, located just on the opposite side of the Village's beach entrance from the Hula Grill offers a more casual (and less expensive) dinner menu featuring island cuisine with chicken, chops, fish, prime rib, steaks and much more. Their downstairs Beachside Grill is another great place for lunch or a light dinner. They also feature live Hawaiian entertainment in the late afternoons. Whalers Village maintains an extensive calendar of events many of which are held at the Village's outdoor Center Stage. These include live Polynesian hula and/or Tahitian dance shows three evenings per week, lei demonstrations and lei making classes, and cultural hula lessons. In addition, annual events include the Maui Onion Festival, held the first Saturday of May, and the Maui Marathon, held each September, for which the Village marks the finish line.